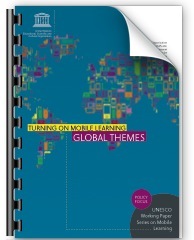 Over the past several weeks UNESCO has been publishing individual titles in its Working Paper Series on Mobile Learning. Recently the Organization concluded the first phase of the Series by releasing two Global Themes papers. These papers, unlike previous titles, are not region-specific. Instead they synthesize information contained in the regional papers to identify salient trends that cut across geographic boundaries. One paper, Turning on Mobile Learning: Global Themes, highlights issues policy makers and other stakeholders should consider when infusing mobile learning into education systems. The other paper, Mobile Learning for Teachers: Global Themes, examines characteristics shared by programmes that assist educators, either by aiding their work in schools or by helping them improve their own pedagogical and content knowledge. The completion of the regional and “Global Themes” mobile learning papers marks an important milestone for UNESCO. After over a half year of effort the Organization has consolidated its burgeoning understanding of the current state of mobile learning and shared this understanding with the world. This represents a good opportunity to step back and ask you to share your opinions about what should “come next.” In light of the findings contained in the recently published papers, where would you like to see UNESCO and perhaps similar international organizations direct their efforts when it comes to mobile learning? What should we—not just UNESCO but all of us involved in ICT in education—do with important information and findings advanced in papers and the Global Themes papers in particular? What do you think are key steps to take to scale and mainstream mobile learning? Written by MARK WEST on May 31, 2012 in Mobile Learning Initiatives. Get to the core of what made some mobile and virtual learning environments successful. Focus on the positives and harness the lessons learnt. Use the negative findings and revisit already existing initiatives to find ways to mitigate future risks. To get the ball rolling to address the present need of 8+ million competent teachers can only happen with mobile technology and ICT. It is not about mobile phones in schools being disruptive, or a technology that is addictive or dangerous any more, it is about the education for millions of potential educators who cannot afford the conventional further education model. It helps if one has a workable system to show decision makers that at least recognised training in a virtual and mobile environment is already possible. If we look closely the secret is already captured in the UNUESCO papers. Focus energy and resources on systems that are already in place for a quality education in virtual and mobile learning environments. The conventional education model can simply not manage educating 8+ million competent teachers. Leverage the wisdom already gained from pilot projects and these papers. Focus on the 2.1 million new teaching posts that need to be established. It is not about empowering teachers in the present system to use technological tools and knowledge to do their jobs efficiently and effectively any more, it is about the 6.1 million needed to replace those teachers that will be leaving the profession in the next three years in any case. Focus on the replacement teacher and on the new teacher. Then provide targeted funding for mobile learning that complies with national curriculum standards to enable sustainability and scalability, because ‘without adherence to meaningful standards of quality, mobile education runs the risk of becoming just propaganda'. The mobile phone holds the key to a number of educational challenges. Notwithstanding the challenges that are inherent with mobile. Those challenges have addressed by other persons who more accurately solutions are possible. In Africa we are excited with the prospects of e learning. We have more mobiles that most continents. When we talk about mobile phones, I hope people realize that we are still talking about basic feature phones, not iPhones or even Android phones. If we look at the US market, arguably one of the more saturated mobile phone markets, we find that feature phones account for about 40% of all NEW phone sales – and this in the country with high smartphone adoption. The feature phone install base (those that already own a phone) is still over 70% feature phones too. So yes, smartphones are growing, but they are no where near saturation. What do you think are key steps to take to scale and mainstream mobile learning? To put technologists together with pedagogical experts and they work together towards achieving main goal. The problem is that most education technology experts are more inclined towards technology and less of pedagogy. Mobile Learning is a promising potential in the world and Africa in particular but let technology experts work together with educational experts and we shall be were we want. Well said, Godfrey. Technologists and education experts need each other and should work together more. I agree, we should start with what we want to do in terms of the pedagogy and them decide on how we can use mobile technologies to enhance teaching and learning. Therefore we need both experts to assist each other. GSMA and Mastercard Foundation just rleased a report on mobile phones and youth across 4 countries in the developing world and their findings were intriguing.First, as you might expect, youth love their phones, even more than clothes, cars, or bank accounts.Surprisingly, youth prefer to receive educational content via via voice, not SMS or mobile web or any other of the many ways we've been delivering content to them. Go figure. I am very disappointed with the review of Africa's mobile learning. Nothing is mentioned of the nearly 3,7 million learners already using services that are provided by MXit of for that matter the Young Africa Live initiative from Vodacom with nearly 1 million users. In a way such half reporting does more damage than good as we are still discussing issues like uptake and scaling when there are services that have been taken up and have scaled. We should learn from these and not be so arrogant that we feel solutions that does not come from inhouse are not valid. As a African I am not satisfied that the breath of mobile learning use on the continent has been reflected at all, neither has the open minded engagement of key stake holders been portrayed. As a naive example the recently published book Mobinomics reflects issues in Africa much more realistic and they only highlight a single instance of Mobile Learning. I think Concerned African has reason to be concerned and disappointed. The UNESCO Report states at the outset that it serves mainly to provide an illustrative overview of mobile learning initiatives in Africa and the Middle East and did not intend or profess to be comprehensive in any way. The Report also admits that there were many initiatives under way that were not known by the collective involved in putting the Report together. Since this Report was written, a host of initiatives have come to light such as the ones mentioned by Concerned African, the Siyavula Project in South Africa and many more. That there is so much happening in the mobile space in general and the mobile learning space in Africa was further evidenced by rich reports and discussions at the recent eLearning Africa conference in Cotonou Benin in May this year. This conference showed that there was a lot more happening in Francophone Africa too which the UNESCO Report does not take into account. The biases towards South Africa and Anglophone Africa is also evident in Allan Knot-Craig and Gus Silber's Mobinomics which Concerned African refers to, where little if any references are made to experiences in North Africa and Francophone Africa. Mobinomics is nevertheless another useful reference for us all as we grow our collective understanding of the value and challenges of mobile learning as an emerging phenomenon on our Continent. Concerned African seems to highlight worthwhile examples of large scale m-learning experiences in South Africa. It will be very enlightening to learn more about these examples from Concerned African and others, especially how these initiatives have scaled, how and what learners are learning, what the learning outcomes are and whether there are any notable improvements in learner performance. The extent to which mobile learning expands access to education, improves the quality of learning and importantly, enables equity in education, remains our paramount objective in Africa and if there are initiatives that are achieving these goals, then we need to learn from them. Please tell us more and thank you again for your post.